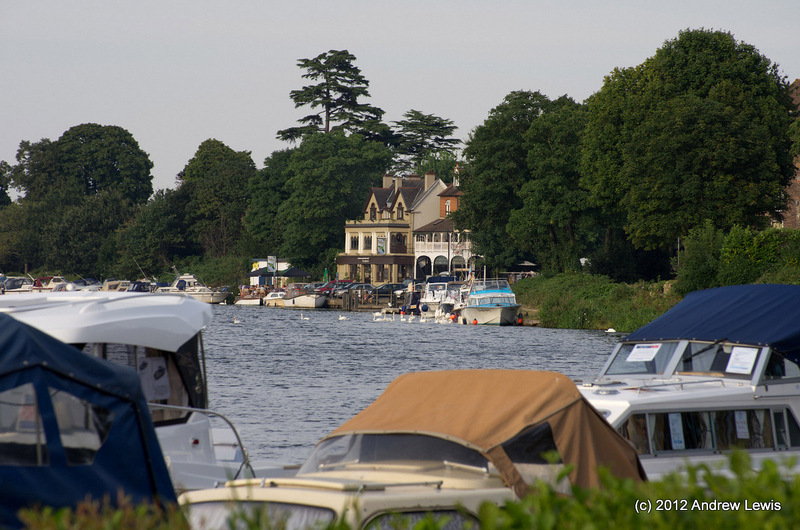 A reasonable length walk from Hampton Court bridge to Shepperton. 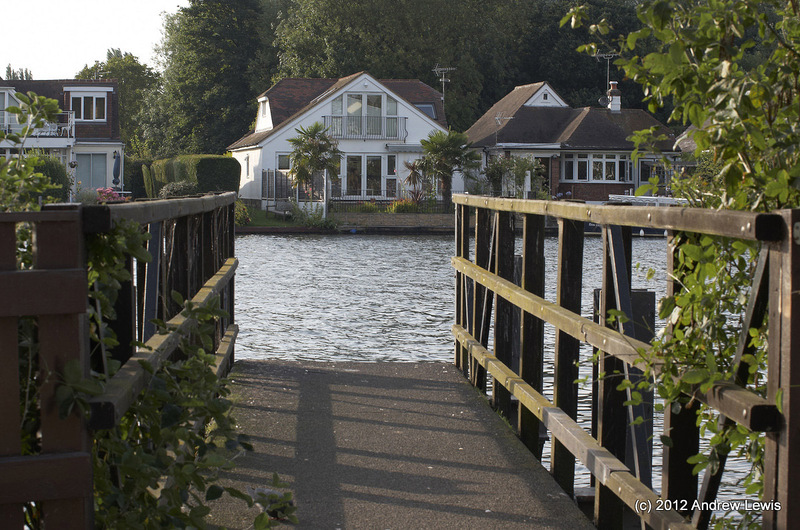 In total, just over 6 miles, including the walk away from the river to Shepperton station. 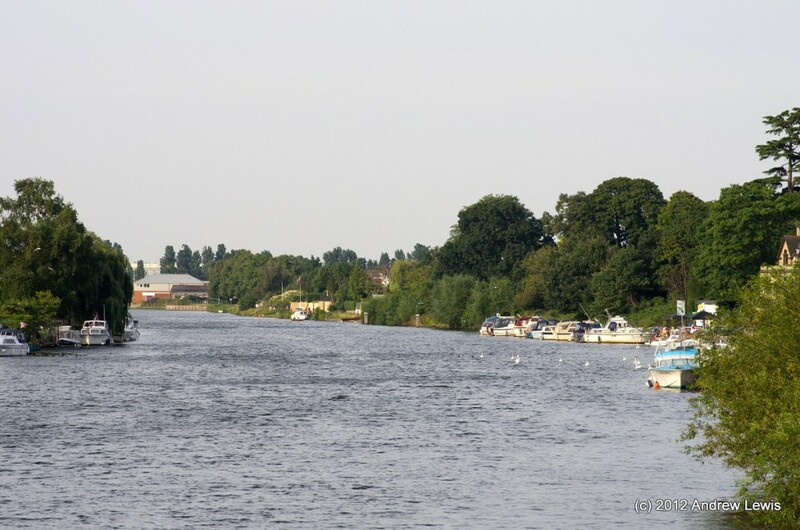 This walk continues along the Thames path, heading generally eastwards from Hampton Court, on a summers day with grey sunshine – bright skies but generally hazy rather than clear blue. From the hotels and restaurants near to Hampton Court bridge and on the opposite side of the bridge to Hampton Court itself, lies the lock. 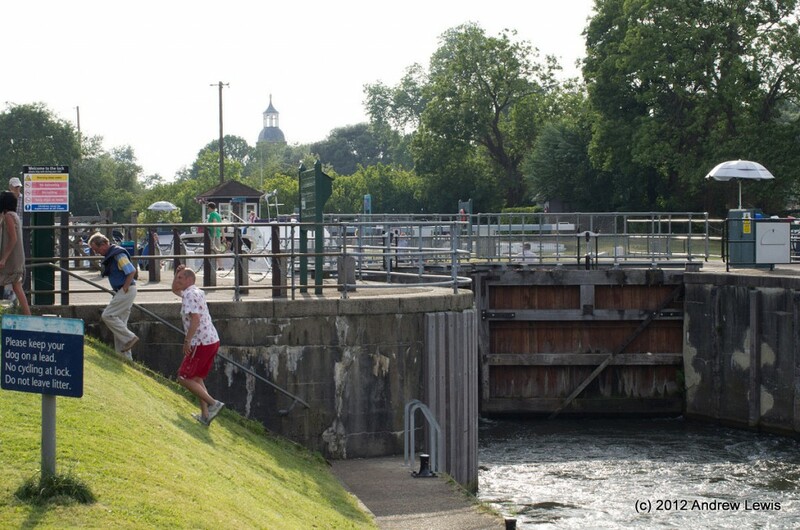 First there is a short section of weir, with obligatory warning posts and pontoons, then a couple of small eyots linked to the main bank by a narrow bridge. 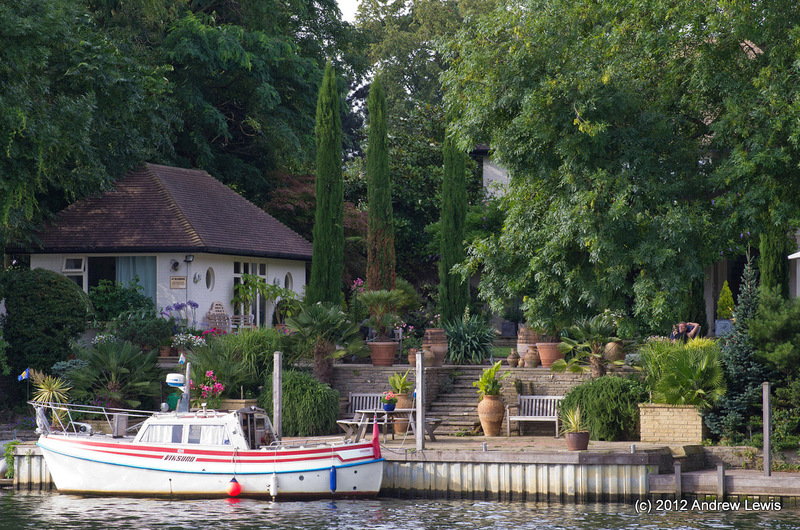 Rather than houses, the residents here live on house boats. A little further along, the eyots give way to traditional waterside properties, with back gardens leading down to the river bank. Some people on Hurst Park appeared to be having some trouble with their bubbles. Something like a climactic end-scene from ‘The Prisoner’. 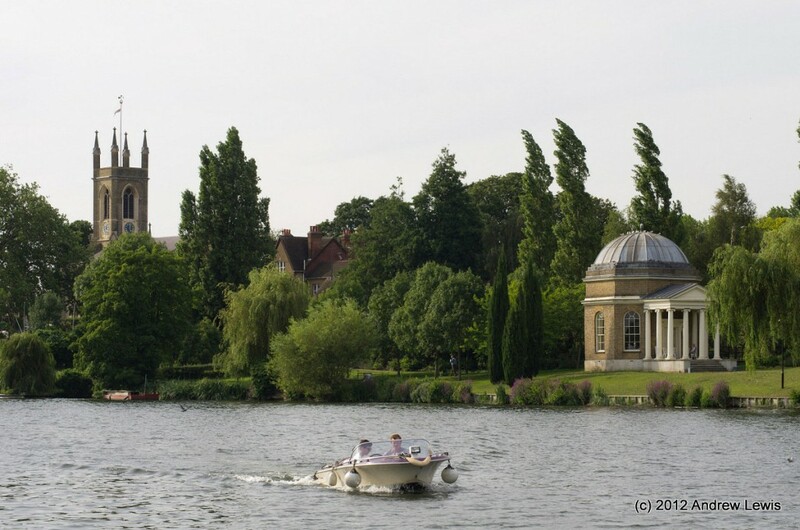 On the opposite bank a more traditional view appeared – Garrick’s temple and Hampton Church. Note that this is now Hampton and not Hampton Court – we have walked considerably eastwards and reached the extent of Bushy Park. We now have a short stretch of path opposite the old Hampton moorings, before the primary school and waterside houses come into view on the southern bank. After a slight constriction in the path due to trees and bushes on both sides, the view opens out as the path runs alongside both the Sunnyside reservoir and the Molesey Reservoirs nature reserve, both out of view behind trees and shrubs on both river banks. 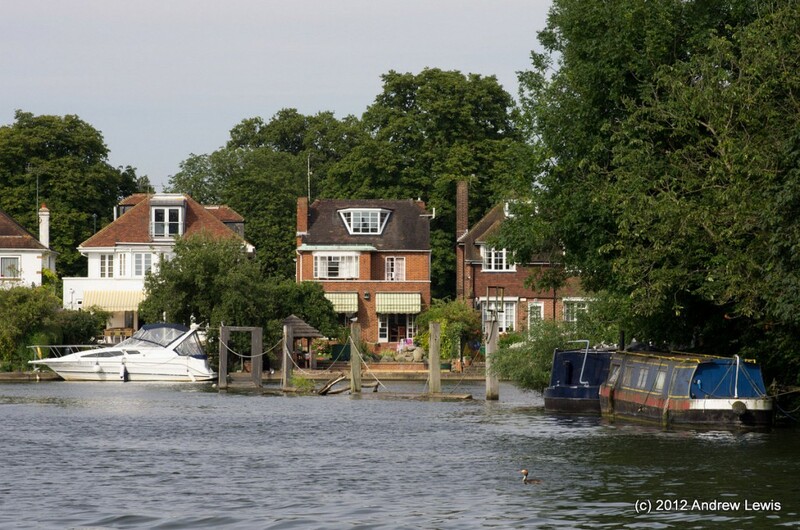 Some wonderful properties and their private moorings come into view to the north as the path turns south eastwards on the approach to Sunbury lock. 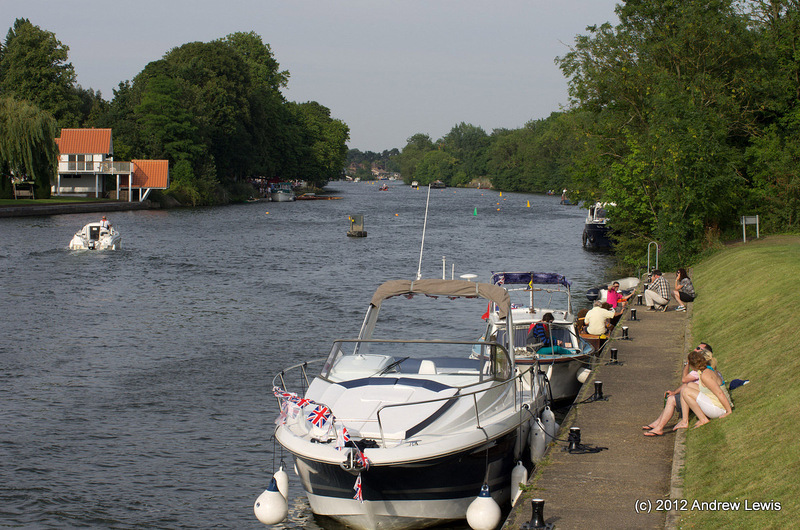 On this busy Saturday afternoon there were plenty of boats wanting to use the locks in both directions and there was a summer fete on the north shore, with river races running along a course in the river. 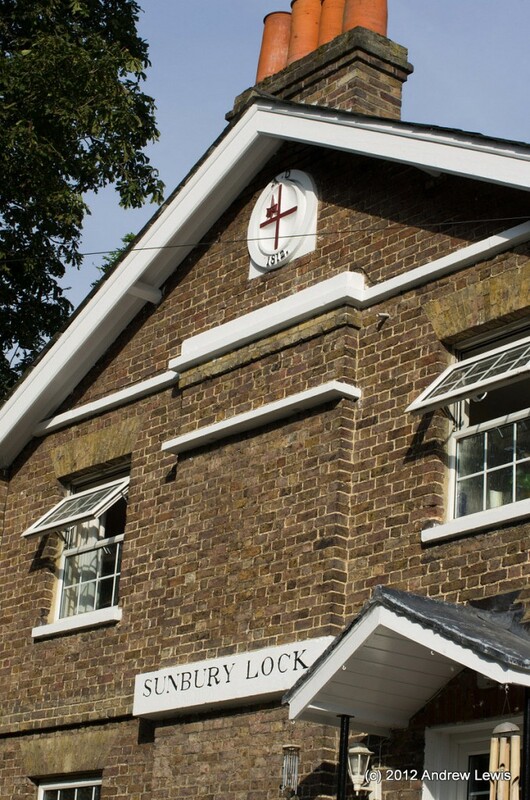 Sunbury lock and its 1812 lock house are next along the path. 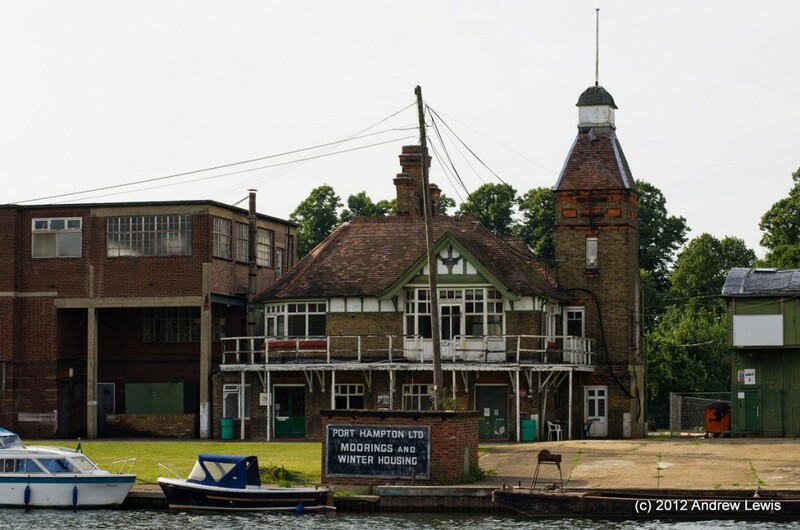 After passing by the lock and the nearby weir, the river opens out again as the footpath runs next to St George’s boat club. 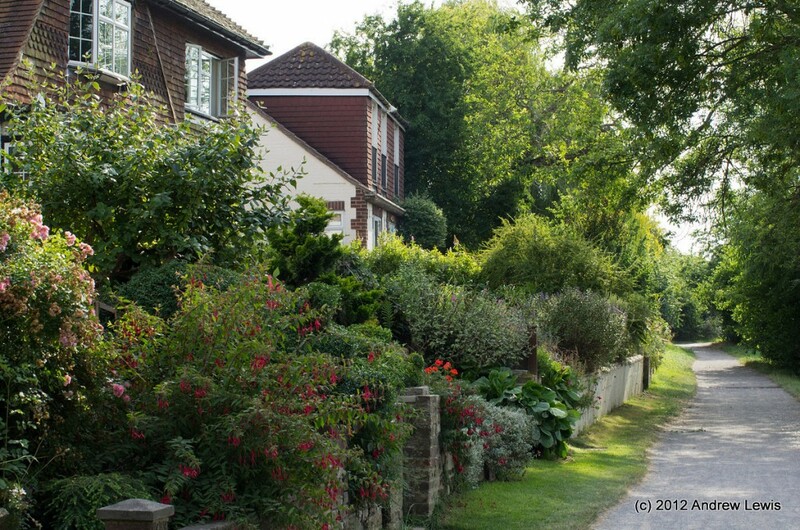 Once more, groupings of waterside properties display immaculate gardens reaching down to the path way and a little further a riverside pub, The Anglers allows for moorings and a quick refreshment among the swans. Both side of the river now have waterside properties and occasional private jetties stick out into the river. The end of the walk soon comes into view, signaled by the bridge and inlet of Walton Marina. 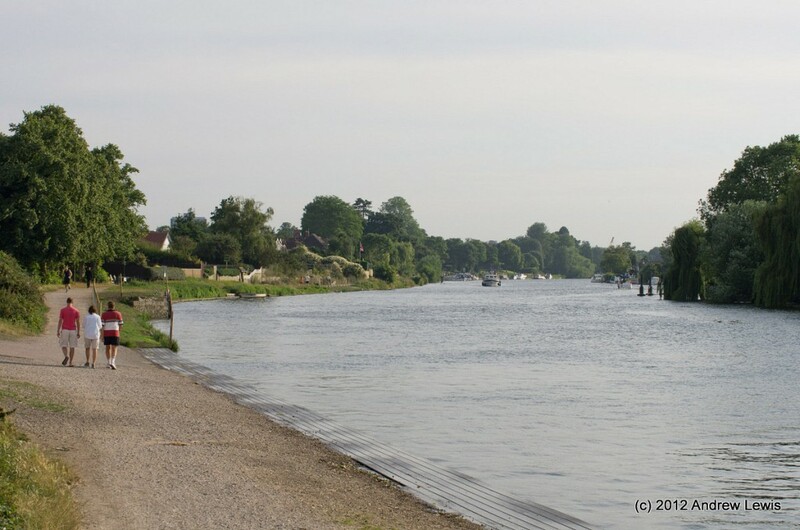 Although the walk nominally ends in Shepperton, the meandering of the river in this area means that Shepperton, which lies north of the river, can only be accessed from the southern footpath by Walton Bridge and a mile long walk. 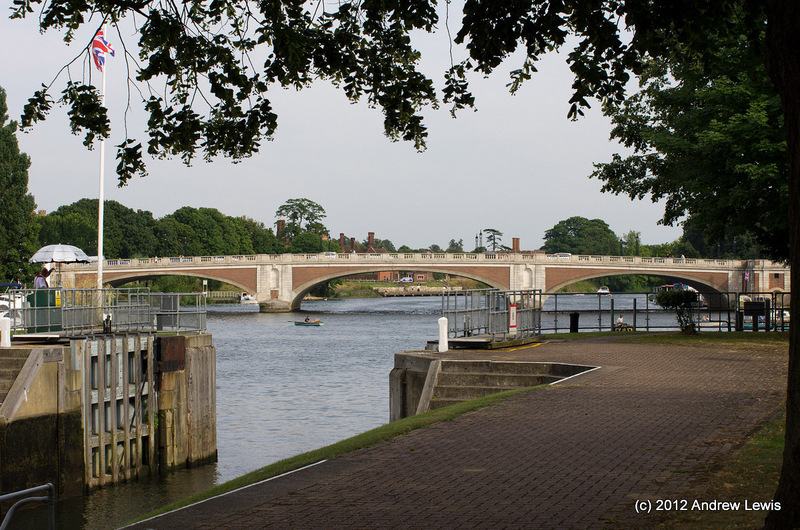 Although there are bridges from the south path to Desborough Island, there are no bridges from the island northwards – probably one of the reasons for the existence of the small Shepperton – Weybridge ferry a little further along. The unfortunate lack of bridges means that this walk has to finish a little early (well before Shepperton) and the next walk (Shepperton to Staines) requires a one mile backtrack to Walton Bridge to be able to pick up the path again, before heading to the ferry. 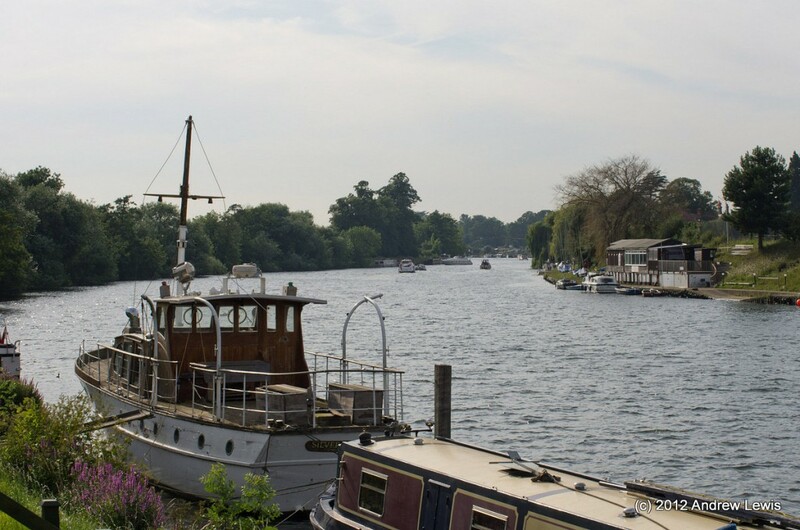 An alternative would be to end the Hampton Court to Shepperton walk with a north bound ferry crossing and then start the next walk directly on the north towpath. 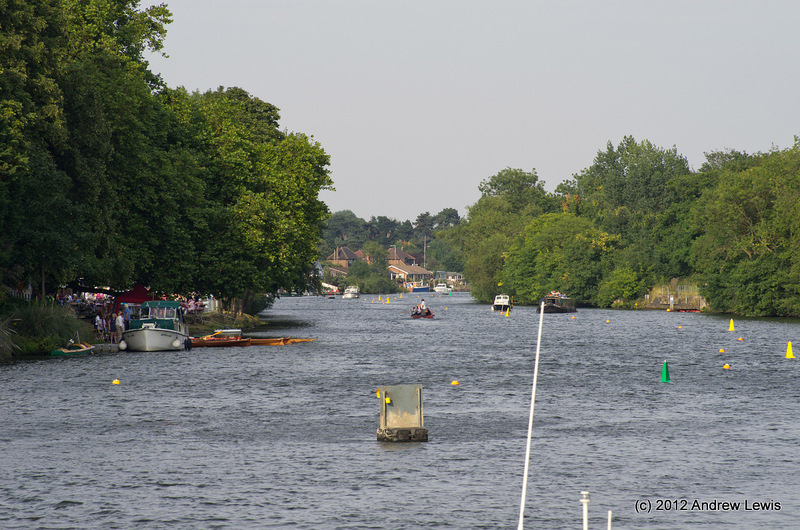 Either way, it’s a one mile walk both to and from Shepperton station.